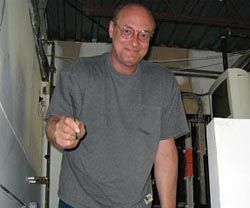 DES PLAINES, IL--It is with great sadness that Gepco International, announces the passing of long-time employee Steve Kusiciel. Kusiciel's friendship with the founder of Gepco, Gary Geppert, started while both were employed at Paragon Studio. They again enjoyed the opportunity to work together later at Streeterville Studios. Then in 1991, their friendship turned into a business relationship when Geppert asked Kusiciel to join the Gepco team on a full-time basis. As the company expanded and additional divisions were formed, Kusiciel took on more responsibilities for the design, installation, and maintenance of many of the factory's manufacturing and processes. Kusiciel soon became a key component in Gepco's operations, taking on lead responsibilities for the company's IT and test and measurement systems. Prior to joining Gepco, Kusiciel worked as an audio engineer, first with the late Malcolm Chisholm and the late Marty Feldman at Paragon Recording Studio and subsequently at Chicago Recording Co. (CRC) and Streeterville Studios. During his audio engineering days, Kusiciel worked on projects for bands such as The Ohio Players and Tyrone Davis. Equally skilled at the console and with the technology behind it, Kusiciel did exceptional work in the studio. From installation and wiring, to equipment repair and calibration, to implementation of the early hard-disk-based recording systems, Kusiciel was a skilled technician and audio pioneer, ready to explore new technologies. "Along with being a close friend, Steve was a part of the company's foundation, a welcoming presence in the workplace and a knowledgeable asset to the team," said Geppert. "Regardless of how busy he was, Steve always made time for friends and co-workers. He was a natural teacher, ready to share his knowledge with anyone who asked. Steve will be deeply missed by all who knew him."